If all you want is the best, go straight to Corfu’s 10 Best Luxury Beach Hotels. One of Greece’s greenest islands, Corfu (also known as Kérkyra) is part of the Ionian island chain off the west coast of the mainland. It has a population of around 150,000 and is roughly 58km x 27 km. You can drive from one end to the other in a couple of hours, although due to windy mountain roads it’s not easy to do a loop in a day; better to stick to north or south. The lush green island is thick with cypress pines and olive groves, and the mountainous terrain provides cool breezes in the summer. This dramatic mountain scenery makes it one of the most beautiful islands in Greece, and also one of the best for beaches. But the mountains also mean occasional cloud cover and higher rainfall and humidity than other Greek islands (and mosquitos). NORTH – The north of the island is home to Mount Pantokrator, Corfu’s highest peak. The scenery is rugged and beautiful with scenic bays and coves, and the northeast has views across the water to the Albanian mainland. EAST – The northeast side has beautiful calm clear waters and pebble/shingle beaches. Its small villages and harbours are dotted with villas and perfect for exploring by boat. Resorts get larger and louder towards Corfu Town. SOUTH – The south of the island, with its sandy beaches, was the first area to be developed during the tourist boom in the 1960s. It’s home to a few big resorts such as the notorious Kavos, although there are plenty of small charming spots left to discover. 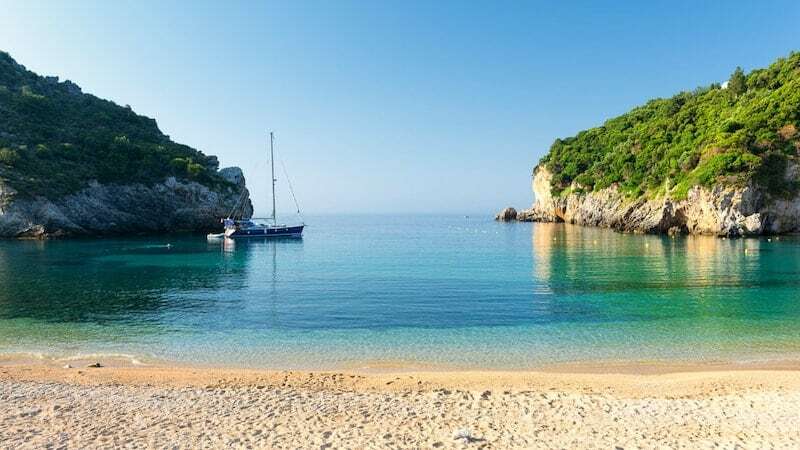 WEST – The west features some of Corfu’s most stunning beaches, all with perfect sunset views and most with sandy beaches (although they get pebbley up towards the northwest). 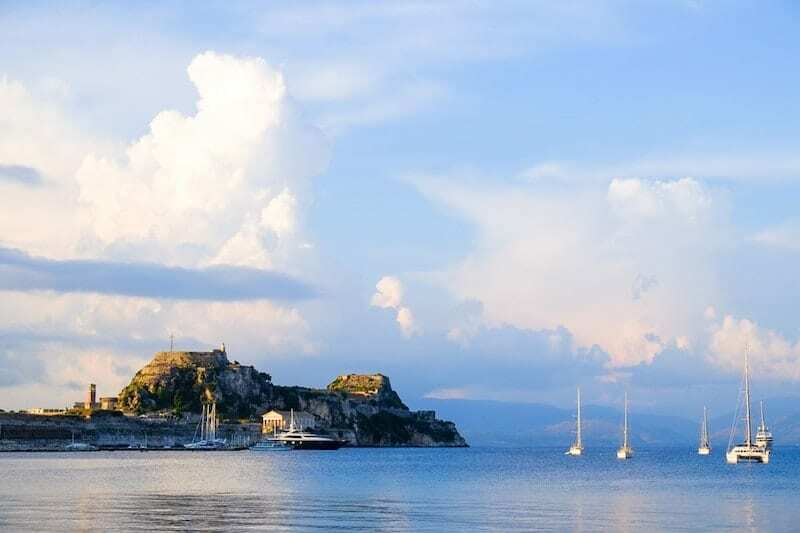 Check out my ♥ Corfu Wishlist ♥ on Airbnb. 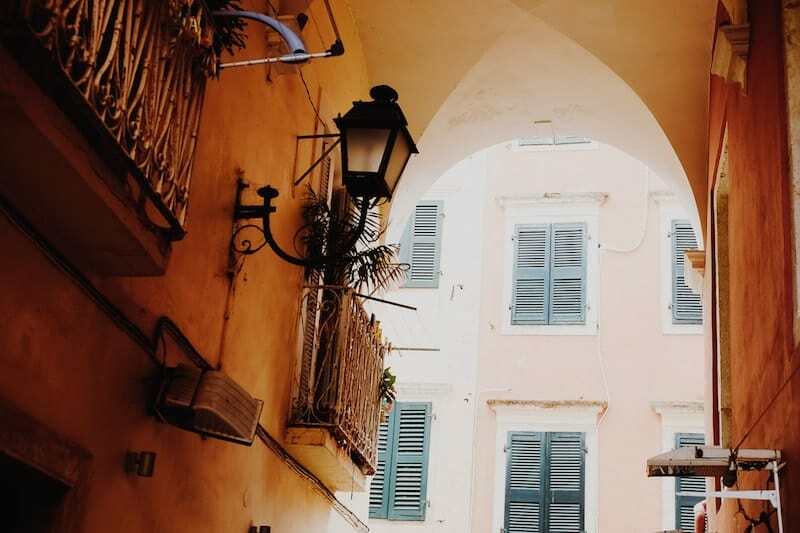 One of Corfu’s main selling points is its beautiful UNESCO World Heritage-listed Venetian old town. The key attraction is the Old Fortress, which juts out on a promontory, but the town itself stretches out into several different areas. The historic centre comprises the narrow streets between the forts and ports. Take a stroll around its cool stone streets that have obvious French influences in its elegant promenades. The facades of the tall town buildings are varying shades of ochre and pink with deep green shutters and woodwork. You’ll find handsome cobbled streets, yacht clubs, cricket ground, and homegrown ginger beer. Radiating back from the Old Town is the commercial centre. To the north, you have Mandouki and the port areas, to the south the wealthy suburbs and sprawl of Garitsa and Kanoni. 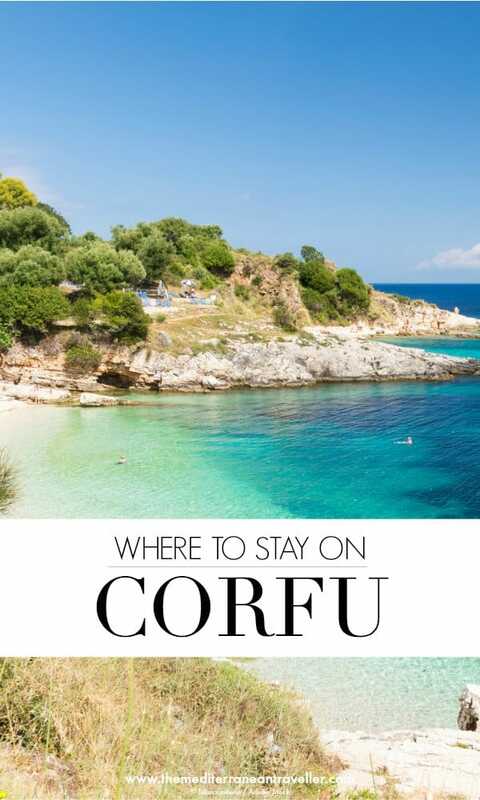 If you’re visiting Corfu over the winter months (October-April) then Corfu Town is your best bet for accommodation as it’s open year-round, rather than just during the tourist season, as does the hub Acharavi in the north. Also known as Kastropolis—City of Castles—this is the part of town with all the main sights. The focal point is the Spianada, the main square between the Old Fort and the alleyways of the historic centre. The cricket ground (a legacy from British rule) and the arcaded promenade known as the Liston (modelled on Rue de Rivoli in Paris) give an aristocratic feeling. If you’re planning on staying in the Old Town it might be worth getting a combined ticket which covers entrance to the Old Fort (Paleo Frourio) plus museums. A trip to the Old Town is a popular excursion for tourists on the island so the main streets are lined with souvenir shops, although it doesn’t take much to get away from the crowds. Stay here: Accommodation within the Old Town itself is somewhat limited and dated, but there are a few exceptions. Siorra Vittoria provides a real feel, it’s an elegant townhouse hotel with a central location. Cavalieri and Bella Venezia are classic hotels in neo-classical buildings, as is Arcadion which has balconies overlooking the Spianada. The decor of Konstantinoupolis is a touch dated but comfortable option. Those with lower budgets are better off checking out chic studios on Airbnb, some of which have great views of the historic rooftops (New to Airbnb? Click here to get money off your first stay). Follow the coast north from the Old Fort and the main road curves around to Mandouki (also spelt Mantouki), roughly between the Old and New Ports. If you’re looking for a less touristy part of town to lay your head (and need to rise early for a ferry (then Mandouki is a good place to start. A historic suburb that was originally home to the city’s port workers, it still retains a traditional character. It’s ideally placed if you have an early ferry to catch, too. Stay here: There are a few rather average hotels in Mandouki; a better bet is to look for cheap studios and rooms such as this one and this one. If you continue south along the coast from the Old Town then the next area is Garitsa Bay, a posh suburb of Corfu Town. The bay itself is home to a Yacht Club and is a popular anchorage. There are a few large hotels with pools behind the main road. A graceful promenade follows the bay around to the opposite end, from where you have excellent views of the Old Fort. It’s a peaceful and charming area with a village feel and a few tavernas, bakeries and quiet bars. It’s a 20-minute stroll into the heart of town. Stay here: Corfu Palace Hotel is on the town side of the bay and has a large pool. At the other end, Mayor Mon Repos Art Hotel is closest to the small shingle beach. 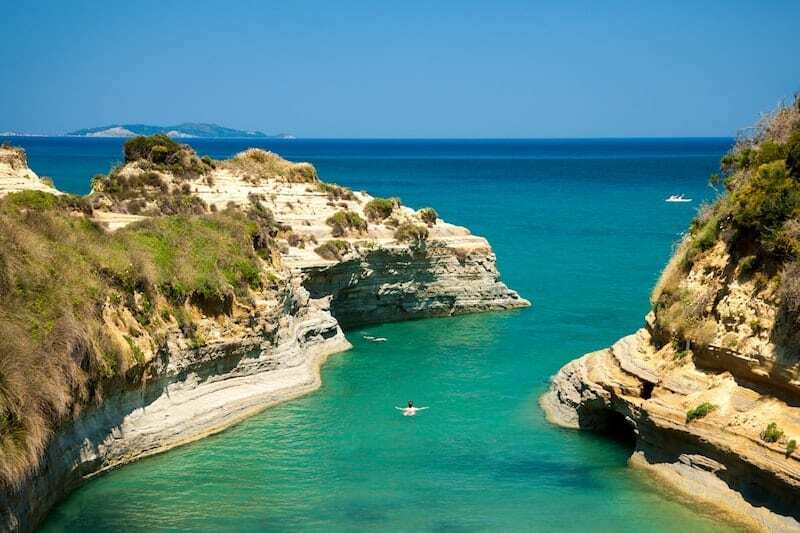 Kanoni is the name given to the peninsula directly south of Corfu Town. It was—in fact—the original capital of Corfu, and is named for the canons which protected the bay. These days it’s an extension of Corfu Town. Keep walking through Kanoni and you’ll reach the Korission Lagoons, and the little islets of Vlacherna and Pontikonisi (Mouse Island) which pop up on tourist brochures. It’s a popular spot for watching the sunset in one direction, the planes come in to land over the lagoon in the other. It’s a 40-minute walk or 10-minute drive to Corfu Old Town. Stay here: The main headland is home to several large-scale hotels cunningly disguised in the thick vegetation, including the Royal Boutique Hotel, Corfu Holiday Palace, and Divani Holiday Palace. All have fantastic views over the water. Here’s a quick rundown of the liveliest beach resorts on Corfu. These are best places on Corfu for nightlife and partying, and/or budget accommodation. In other words, if you’re looking for a quiet holiday then these are the places to avoid. Originally a fishing village, Sidari is now a busy tourist resort (though not in the same crazy league as Kavos) particularly popular with the English. Sidari’s main beach has Blue Flag status and watersports aplenty. According to local legend couples who swim through the scenic rocks at the Canal d’Amour (Channel of Love) will be married soon—just don’t expect to have it to yourself. Aqualand is nearby, and there are plenty of watersports and boat trips so it’s a good base if you like to be entertained. Stay here: Value is the name of the game in Sidari; many of the rooms here are snapped up by tour operators and you can find some good deals from the UK on TUI, Jet2, Olympic and Thomas Cook. If you’re looking to go DIY then Del Mare Beach Hotel is close to the Canal d’Amour and has fresh blue and white decor. Check out Sidari Beach Hotel and The Wave both just metres from the beach, and Lena, Jasmine and Maria for traditional studios with access to communal pools. Ipsos (also spelt Ypsos) used to be one of the big party towns on the island but has calmed down over recent years and is now a good compromise suitable for families in the lively evenings. It’s scenic, too, with its long stretch of golden sandy beach and backed by green mountains. Restaurants tend more towards international tourist fare than traditional tavernas though. Pyrgi is a mini resort situation between Ipsos and Barbati. Its long beach is a mix of sand and shingle backed by pines and tavernas. Pyrgi’s location makes it an excellent choice if you’re looking for somewhere relatively quiet but with easy access to nightlife and activities and the something other than Greek food. Stay here: Try the traditional family-run Hotel Yannis which has had an update and is a short walk to the sea. Villa Sofia offers great value self-catering with a spotless pool. For those on a budget, The Comfy Hostel is near the sea and has cheap dorms and studios. Onar Apartments are right on the beach. Valentino Corfu aparthotel in Pyrgi is a favourite with return visitors for its lush landscaping and friendly vibe. If you prefer to go packaged, Olympic has holidays at Yannis and TUI at Antigoni in Pyrgi this year. Barbati is a vibrant beach resort wedged between the mountains and the sea on the east coast, just 20km from Corfu Town. An ideal mix of relaxing scenery and facilities, Barbati is a hit with families for its mile-long Blue Flag shingle beach. Nissaki, Ipsos and Corfu Town are all a short drive away. Stay here: Pantokrator Hotel is the pick of the bunch here for its long pool with sea view, but there are plenty more apart-hotels along the shore with terrace pools such as Captain’s. Verde Blu and Crystal Blue are both highly rated. If you’re more of a beach person than a pool person, Renata has rooms just off the beach. The main 18-30 resort on the island; if you’re barely out of your teens and cheap all-night partying is your bag then look no further. But Kavos also has the cheapest accommodation on the island. 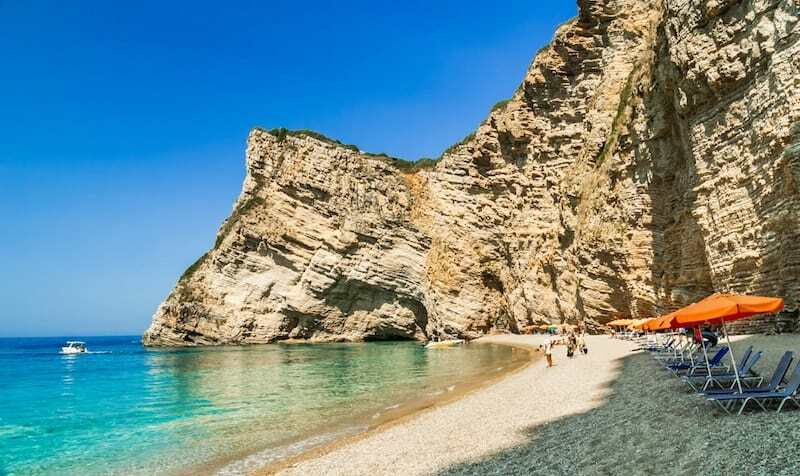 If you don’t mind the noise and crowds then you can bag some bargain last-minute packages from the UK which can be the cheapest way to get to Corfu. Stay here: Check Jet2 and TUI for cheap last-minute package deals from the UK. Many of the hotels right near the action host pool parties; look at Kavos Plaza, Morfeas and Quayside Village. Buzzing Kassiopi is one of the main resorts on Corfu yet manages to retain something of a traditional fishing village feel. The beaches here are pebbly but it has a picturesque setting (including a Byzantine castle) and is the most charming of the big resorts with a good mix of package and independent tourism. There are plenty of cafes and bars around the main harbour to keep you entertained in the evening. Stay here: Melina Bay Boutique Hotel is the top-end offering in the area and has a great location right between the fortress and the waterfront. There’s a good selection of traditional beach hotels such as Memento, studio apartments, and villas with great pools. Fans of history and coastal chic can rent the Harbour House. Close to Kassiopi, the stylish and modern Bella Mare is by the beach and rated highly. No overview of the best party places to stay on Corfu would be complete without mentioning the Pink Palace. This legendary hostel (and yes, it is pink) is a party-loving backpacker’s institution and a resort in its own right. It’s not quite what it used to be, but think toga parties, beer pong and ATV tours. 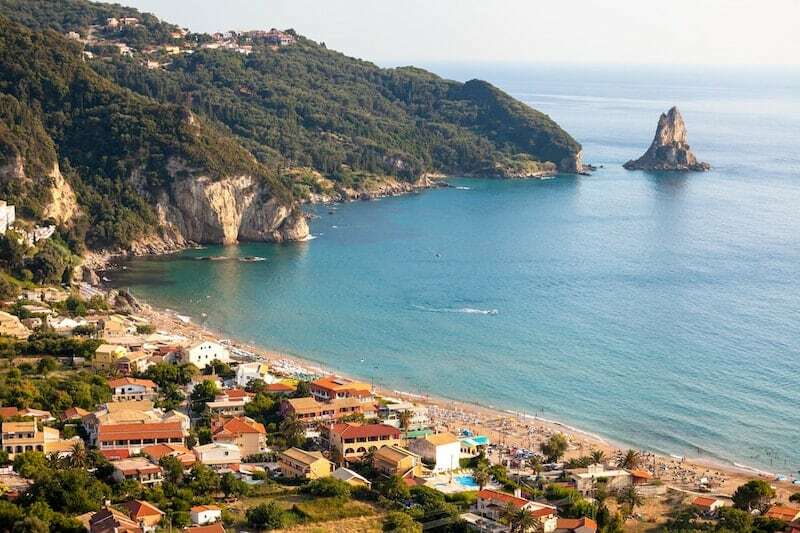 It’s situated on the west side of Corfu on the lovely beach of Agios Gordios and is great for solo travellers and groups looking for maximum fun on a minimal budget. 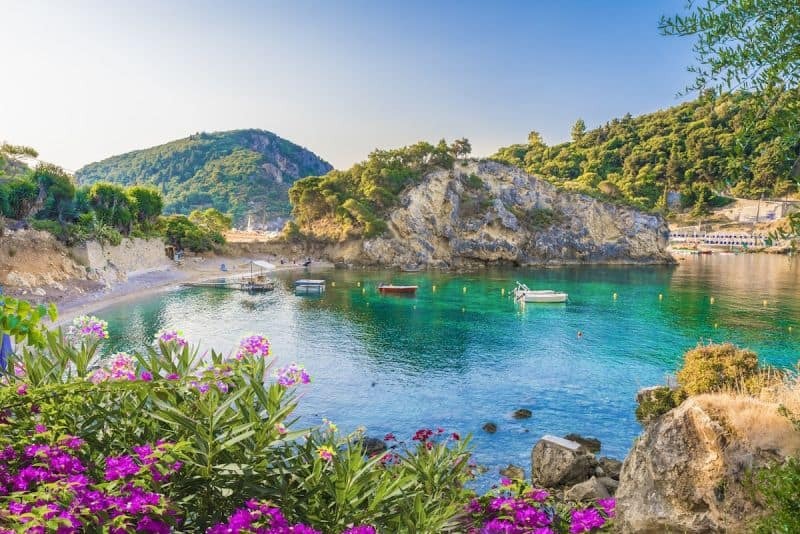 The number of beautiful serene bays strung along the north coast of Corfu make it one of the best places in the Med for a quiet package holiday. Head to this part of the island if you’re looking for authentic unspoilt Corfu, romance and nature. Of course, it’s beauty and relative solitude are reflected in the prices and upscale tourism that it attracts. Posh villas abound. The northeast is known as Kensington-on-Sea for its popularity with wealthy Brits (although wealthy Russians are equally as fond of the area). Some of the best quiet places to stay in Corfu are the tiny coves and tranquil villages in the idyllic northeast. And if it’s the best quiet beaches you’re after, Corfu’s hidden gems are along the west coast where the mountains meet the sea. Many beaches in the south of the island were lost to overdevelopment in the tourist boom of the 1960s, but there are still a few spots where charm (and sandy beaches) remain. Often referred to as the ‘Jewel of Corfu’, Paleokastritsa is a small and pretty resort in the north of the island home to emerald waters. This idyllic resort is surrounded by pines and has developed along a coastal road that winds around a series of six picturesque bays. Beaches here are a mix of pebble and sand, and there are enough bars and tavernas to keep things lively in the evenings. The scenery is some of the most dramatic on the island making it a popular stop for island excursions during the summer. Don’t miss the scenic walk up to Angelokastro, the Byzantine fortress that looks down over the village from a hilltop. Be warned – the bays are great for swimming for the water here is renowned for its cold temperatures! Stay here: Paleokastritsa is home of mid-range tourism on Corfu, so packages are available on all the major UK operators such as TUI. It’s not too built up meaning you’ll never be too far away from one of its beaches or bays, and there’s plenty of good-value small apartment complexes such as Angels, RoyalRose, Aphrodite, Paleo Inn, Miltos Studios. The biggest resort-style hotel in Paleokastritsa is Akrotiri Beach Hotel, whereas the family-run Zefiros Traditional Hotel has a bit of a boutique vibe. If you’re after a pool with a view, consider the Golden Fox Complex up in Lakones, the village above Paleokastritsa. 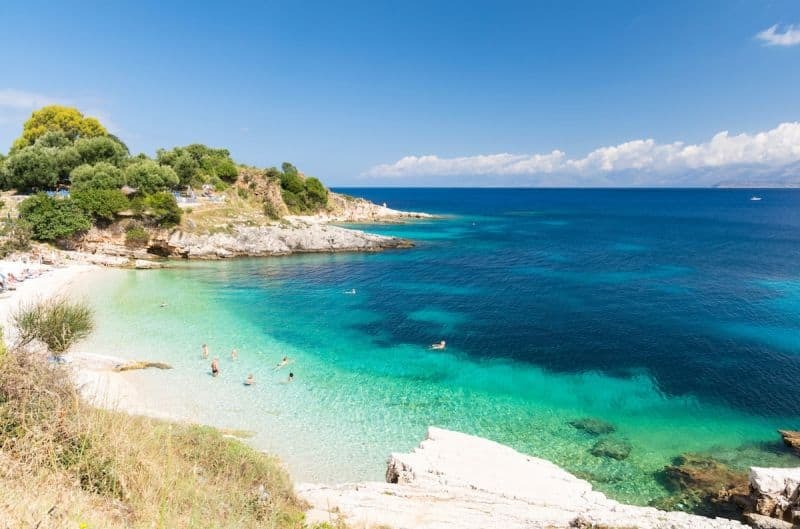 Kalami is another one of Corfu’s beauty spots, with its small pebbly Blue Flag beach looking across the water to Albania. Kalami is famous for its association with the Durrells—Lawrence lived here with Nancy in an old fisherman’s cottage known as the White House. Just around the headland is the equally charming fishing village Kouloura and the lovely pebble beach at Kerasia. It’s a great area for tranquillity and stunning scenery (although the channel is busy with shipping); rent a car or boat to see the best of it. Oh, and there’s a Festival of Pie during the summer. Stay here: Durrell fans can stay or dine at The White House. Up in the hills between the two villages is the San Antonio Resort with cool neutrals and adults-only policy. Otherwise, it’s best for those who enjoy nature and are looking for self-catering accommodation. Paleopatres has a number of modern and comfortable apartments with a shared pool in Kalami. If you want a pool to yourself, Villa Regina has an infinity pool with gorgeous views over the bay. South along the coast, you’ll find the scenic bay Agni with its white pebble beach. There’s something special about this place; its simple but seductive charms attract a well-heeled clientele who jet in on their private speedboats. There’s a trio of tavernas here which are well-known for their seafood. Mark Ellingham, the founder of travel brand Rough Guides, is a fan, as are British politicians George Osborne and Peter Mandelson. Stay here: You can rent rooms at Nikolas Rooms or splash out on one of the villas in the area – Artemis, The Olive Press, Rana, Lina, Spiti Antigone, Nikolas Agni or Aquamarine. 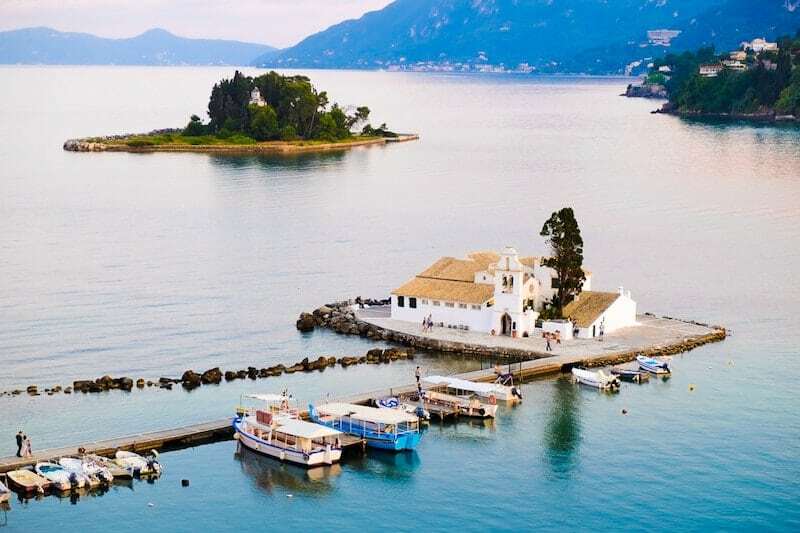 This peaceful village is set around three coves, Nissaki an excellent destination for walkers as there are trails rising up into the hills behind, with the 220km Corfu Trail passing through. Kalami, Kassiopi and Agni are within easy reach to the north, Corfu Town to the south. If you don’t mind pebbles then the sheltered beach is one of the prettiest on the island, with clear waters perfect for snorkelling. Kaminaki and its shingle beach are a little further along to the south. Stay here: For big hotel facilities, there are plenty of options strung along the coast, the best of which is adults-only TUI Sensimar Atlantica Nissaki Beach. There are simple apartments close to the beach at Kaminaki, Krouzeri and Zeus. If you’re after a villa then Villa Hera has a day bed by the pool for a splash of added luxury, or The Old Stone House (through TUI) combines traditional charm with a private pool. Confusingly, there are two places called Agios Stefanos on Corfu. This one is on the northeast coast (hence the NE in brackets – find it here on Google Maps), north of Kalami and Kerasia. It’s another peaceful, unspoilt bay with a fishing heritage, good tavernas and a smattering of watersports in high season. Stay here: The duplication of names (both have a variety of spellings) makes distinguishing between the two villages difficult; here’s the page you want for this one on Booking.com. Accommodation here is mainly upscale villas; you may well be rubbing shoulders with the rich and famous at the (slightly overpriced) tavernas. The other Agios Stefanos (also known as San Stefanos, its Italian name) is over on the west coast of the island and has a wide crescent-shaped sandy beach. It’s flanked by gentle hills rather than the mountains of other towns in the north, and so feels a bit more spacious and spread out. There’s plenty of room on the beach for everyone which makes it popular with families looking for a quiet holiday. Stay here: Here you’ll find the Delfino Blu Boutique Hotel, one of the best hotels on Corfu, and plenty of well-equipped self-catering accommodation such as Pictures Suites and Paralia Luxury Suites. Further down the coast is the long straight seaside resort of Arillas, which has a quiet feel and—like Agios Stefano NW—is popular with families. The Blue Flag sandy beach is protected from winds by the two headlands at either end and the waters are shallow. There are enough tavernas to eat somewhere different every night but head south around the bay to Agios Georgios for watersports and entertainment. The village hosts a small wine festival at the start of September. Stay here: Arillas is home to several large family-friend hotels which are all fairly similar in terms of amenities; Hotel Horizon and Hotel Marina are directly on the beach. If you prefer small and friendly check several streets back at The Rainbow and Mathraki. Package holidays can be found at Thomas Cook and TUI. The gorgeous Glyfada is a favourite beach with locals. Up in the hills behind lies Pelekas, one of Corfu’s hidden gems. This typical Greek village has traditional stone architecture and amazing sunset views. The roads wind down to the beaches of Glyfada, Pelekas and Myrtiotissa. Pelekas has a bit of a backpacker vibe, whereas Glyfada is more upmarket and the scenic Myrtiotissa is paradise for nudists. Laid-back Agios Gordios is in the middle of the island on the West Coast, which is surrounded by high green mountains which give it a very pleasant feel. It has a beautiful 1.5km long sandy beach (some parts are shingly), which is organised and has watersports. There’s a good choice of tavernas but it’s not overly rowdy, despite proximity to the Pink Palace. In fact, Agios Gordios is one of the best resort on Corfu for mature couples and families with small children, especially if you can find an apartment that doesn’t require much of an uphill walk; there’s good access for cars and via public transport, enough tavernas to keep you entertained over a short holiday, the centre of the resort is flat and easily walkable although much of the accommodation is on the slopes. not too isolated. Lots of amenities and apartments, and only a 35-minute drive to Corfu Town. Mainly apartments with just a few hotels. The beach is lined with tavernas and a few beach bars for watching the sunset. Regular buses to Corfu Town. No wonder this resort has a loyal base of repeat visitors. There’s a lovely walk to Paleokastritsa. Stay here: Mayor La Grotta Verde Grand Resort is the standout here; a 4-star adults-only hotel right on the beach with a spa and seafront pool. For a more traditional Greek experience, the 11 rooms and pool at Dina’s Paradise Apartments are popular, as is the lovely little Sebastian’s Family Hotel which is attached to a taverna. Both are surrounded by lush gardens. Sea Breeze is right on the beach and has apartments available as well as room. Agios Gordios is also home to the infamous Pink Palace, a backpacker resort (i.e. a hostel, and the only proper one this side of the mainland) which is situated up in the hills behind. A bit of an institution on the Mediterranean backpacker scene, the Pink Palace has been entertaining backpackers with toga parties and quad bike tours for decades. There’s plenty of organised activities and rock-bottom prices. Some rooms require a bit of trek uphill. 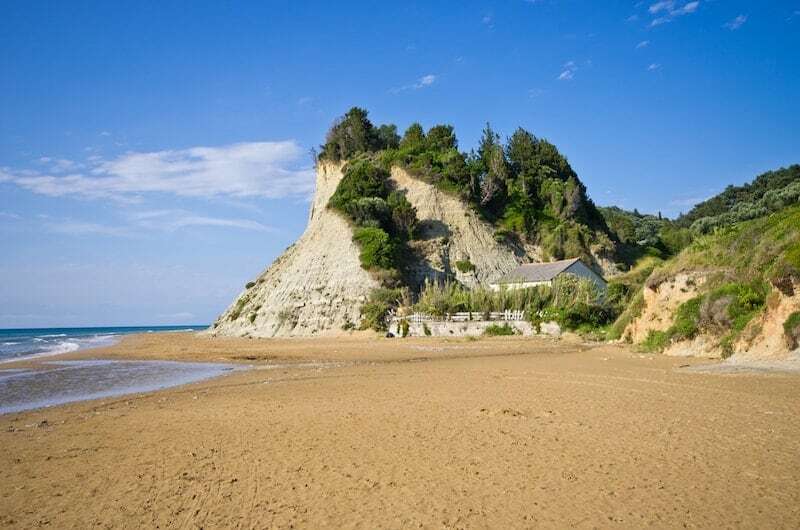 A small beach village on the West coast, Liapades is one of Corfu’s hidden gems. 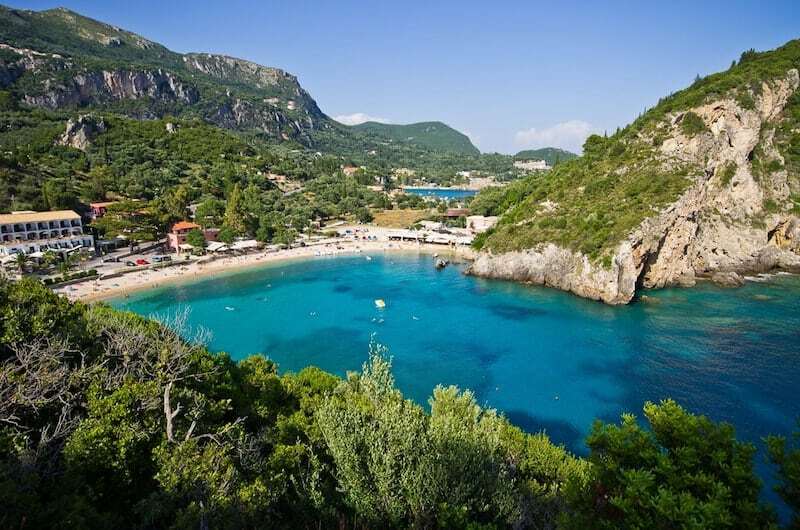 Most holidaymakers head straight for Paleokastritsa, just 4km to the north, but Liapades has a much better beach. The village proper is 10-15 minutes uphill and has a traditional Ionian feel. There’s a road down to the beach area where there is the usual assortment of tavernas and apartment. It has escaped over-development and has a more Greek feel than most resorts on the island. The beach is small and shingly sand, and there are lots of little beaches in the surrounding area to explore if you’re feeling adventurous or if the main beach gets too busy (try Rovinia). Come here if you want to feel off the beaten track and to feel surrounded by nature. Stay here: Blue Princess (previously known as Elly’s Beach) has a great location but gets mixed reviews; skip it for apartments with a sea view to make the most of the landscape such as the rather swanky Rokamare, the sweet and simple Anna Pension, Paradise Studios and Villa Eleni Studios. If you need a pool then Corfu Pearl can oblige. Up in the old village, you can sample local life at Nikos’ Village House or Anastasia’s Eco Cottage. Benitses is known for being one of the nicest beach resorts on Corfu, along with Paleokastritsa. Up until the 80s, it was a notorious party resort, up there with Kavos. But since then Benitses has calmed down and reinvented itself as a thoroughly middle-class family destination with a quaint fishing village feel. Benitses is built up around a pleasantly landscaped harbour and parts of town have a traditional bougainvillaea-draped appeal. It even has some (minor) Roman ruins, and the oddity that is the Shell Museum. Proximity to Corfu Town is a selling point here: the journey only 12km and well served by buses. Stay here: Until the rumoured Angsana hotel opens, the posh Manor House on the San Stefano Estate with its private pool and boat mooring is the fanciest place to stay. Mid-range hotel options near the beach include Hotel Kaiser Beach, and Potamaki Beach Hotel. The cheery Bella Vista is a family-run hotel that has single rooms for solo travellers. Potamaki Beach Hotel has a seafront location. If you’re looking to go self-catered, you’ll find a traditional warm welcome at Villa Sofia, Villa Martha and Panos Rooms. Acharavi is the main resort on the northern strip of coastline although it still has a quiet feel. It has a 3km long beach of organised golden sand with pebbles. Acharavi is a lively town and in season hums with cafes, restaurants, activities and souvenir shops. The streets are wide and flat, the water is shallow and the Hydropolis Water Park is at the edge of towm. It’s on the quiet side in the evenings due to the proliferation of all-inclusive resorts, but is a popular choice for young couples, families and older travellers. It’s also one of the few resorts that doesn’t completely close down in the winter as it’s the main hub in the north. Head to nearby Roda for a better choice of restaurants though. Stay here: Mr and Mrs White Corfu is the standout in the area, with a chic white boutique vibe with 4 star facilities. Elsewhere in Arachavi, accommodation is good value but can feel a bit dated at the trad big all-inclusive hotels. Try the well-rated Lena Beach Hotel, small independently-run aparthotels available such as Aparthotel Ano., or the clean and fresh rooms at Frida. Package holidays to Acharavi can be found with Jet2 and TUI. Around the northern coast of the island sits Roda, a small fishing village with a good beach. Some of the old village buildings remain. The resort has its fans (it’s particularly popular with Germans and mature travellers) who love its workaday charm, friendly locals, extremely relaxed vibe, organised beach and assortment of Greek and international bars and restaurants. The beach is dark sand/shingle prone to influxes of seagrass which may put some off, but if you’re a pool person any then Roda is one of the most laid-back spots on Corfu. Acharavi is within walking distance. Stay here: The large Roda Beach Resort & Spa has a beachfront location and plenty of facilities (you can find packages with Thomas Cook). For local charm, Ninos On The Beach is between Arachavi and Roda. The Paradise Village complex has clean modern interiors and a variety of villas and studios to choose from. Gouvia is home to the yachting fraternity on Corfu. Formerly a fishing village with Venetian origins, there’s not too much there beyond its chic marina and the bars and restaurants serving it. It’s not the best location for beaches—it has a couple of small shingle beaches although the water can be a bit murky. During July and August the sailing crowd bring a buzz to the place though. Around the corner, Kontokali is a small village on a peninsula in the Gouvia Bay which has undergone a bit of an upgrade. These days the headland is home to some large fancy hotels. There’s a sandy Blue Flag beach and a couple of beach bars. Stay here: The 5-star Kontokali Bay Resort & Spa is one of the top hotels on the island. It’s here that the cast of the Durrells stayed here during filming of the hit TV series. The hotel even has its own beach (although the public access is allowed). Hotel Louis Corcyra Beach is a 4-star monolith on the same peninsula and available through TUI and other tour operators. There are a few hotels large hotels in Gouvia too: Art Hotel Debono is one for the daybed fans. For simpler tastes and lower prices try Iliada Beach Hotel or Kalypso in Gouvia.